In a pressure cooker, cook mutton with salt. In a pan, add oil, ginger, garlic, tomatoes, green chilies and sauté well. To this add all the dry powders (chili, garam masala, coriander) and curd. 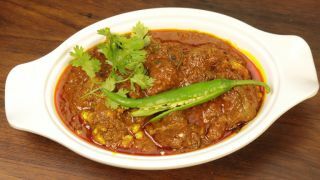 Add cooked mutton, mix well and cook it again. Gravy should cover the mutton pieces. Add curry leaves, coriander leaves and mix well.